About Our Firm: For more than 25 years, the founding members of Villanueva & Sanchala, PLLC have practiced law in New York's Supreme Court and Federal Courts. We have represented injured parties in motor vehicle accidents, premise liability, labor law construction site accidents, and a multitude of other significant cases. We are dedicated to your case from its inception and will assist you in exploring your options and ensuring that your rights are preserved. Call us today at (800) 893-9645. When you or a loved one suffers an injury as a result of a car accident, scaffold accident, or whatever may come your way, we will provide you with knowledgeable and aggressive legal strategy to fight your case.Our team of personal injury attorneys are lead by Joseph P. Villanueva and Alex Ayoub. They are heavily involved your case. Together, they have tried numerous cases to verdict and made their client’s whole again. At Villanueva & Sanchala, PLLC we understand the importance of aggressively fighting your case. Let our Former Prosecutor fight for you. Call us now at (800) 893-9645. We proudly offer home, hospital, and nursing home visits in the event that you cannot travel to us. 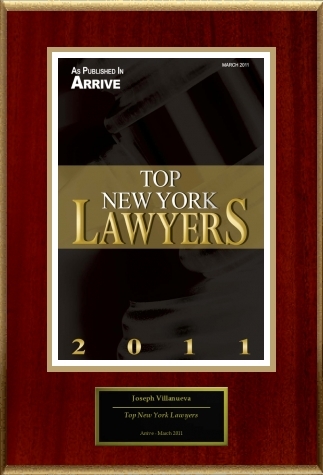 Let us travel to you.With several offices around the New York City and surrounding areas, we are strategically located to handle cases throughout Bronx, Brooklyn, Nassau County, and Westchester County. Call us toll-free at (800) 893-9645 to schedule your free consultation with an experienced New York City personal injury lawyer.